Powerful insights from your residents to improve your destination competitiveness. The global standard for measuring residents’ sentiment towards tourism. Hospitality of residents is a primary driver of a positive visitor experience. Tourism growth requires a collective effort between various stakeholder groups including governments, small business, and local residents to be committed to tourism management. 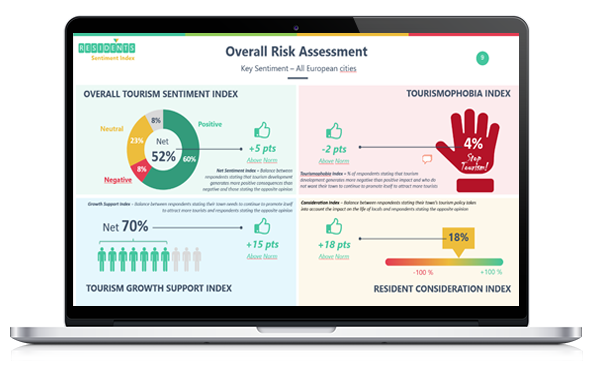 TRAVELSAT© Resident Sentiment Index measures residents’ attitude and support towards tourism across 30 essential categories with in-depth insights bench-marked against your competitors and global norms. The end result, trusted insights to help you guide your destination development efforts with confidence. Local, regional, national Tourism Boards and DMOs in North America, Caribbean, Europe, Middle East, Indian Ocean and Asia Pacific. Based on 8 years of consistent systematic research, and data quality control procedures, TRAVELSAT© Resident Index is designed to ensure the highest quality actionable insights. Resident support for tourism, resident quality of life, traffic, crowding, price, security, pride of place, cleanliness and more. Benchmark your Resident Sentiment Index against similar regions, cities and neighborhoods to identify opportunities to improve your competitiveness. More than performance benchmarks, TRAVELSAT© Resident Sentiment Index provides the trusted insights tourism destinations need to confidently develop their destination development and growth strategies. Do you currently understand your residents’ attitude and support towards tourism in your destination? With key insights gathered from TRAVELSAT© Resident Sentiment Index, you can proactively develop resident engagement strategies as part of your overall destination master planning efforts. Is local hospitality part of your competitive differentiator for your destination brand? Do you emphasize local hospitality in your marketing communications and it is part of your value proposition? If yes, then TRAVELSAT© Resident Sentiment Index is a powerful resource to understand the nuances of your residents’ attitude towards tourism and positioning of your destination brand. Are you effectively converting insights into action to mobilize your industry stakeholders? Our quantitative methodology will help you provide valuable data to gain alignment across stakeholder groups. By assessing opinions on several different factors, TRAVELSAT© Resident Sentiment Index will help prioritize areas with the largest impact and build a sustainable destination plan. Are you developing new tourism product? Are you encountering resistance from residents? In as short as 5 weeks we can produce a report to help shape your communication and PR strategy by better understanding residents’ concerns. Interested in seeing how TRAVELSAT© Resident Sentiment Index can help transform your business?